EP Fastpitch recognizes that pitching skill improves as the athlete dedicates more time to practicing their pitching outside of team-organized practices. With our excellent relationship with Gustavus Adolphus Head Softball Coach (and EP Fastpitch Pitching Instructor for the past several years), Britt Stewart, we are excited to provide an opportunity for young players to develop their pitching skill during weekly. hour-long pitching clinics each Wednesday, starting in July, during the 2017 summer. Pitching clinic fees are due at your first sesssion, payable to Britt Stewart. All pitchers must have someone present to catch their pitches. EP Faspitch encourages the parent catcher to sit on a 5-gallon bucket. Padded lids (like this) are available in many places. 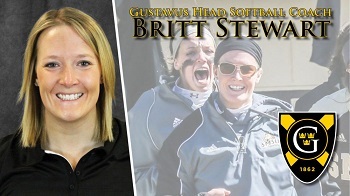 A native of Minnetonka, MN, Coach Stewart was named Head Softball Coach at Gustavus in JUL2016. Previously, Stewart spent 3 seasons at Southwest Minnesota State as Lead Pitching and Assistant Hitting Coach. Stewart played 2 collegiate seasons at Augustana University before transferring to Winona State University in 2010. At Winona State, Stewart was a two-time All-NSIC and two-time All-Region honoree where she hit a combined 14 HRs, 22 doubles, 81 RBI. As a pitcher, she finished 24-12 in two seasons with 11 complete games and 121 strikeouts. At the plate during her senior season, Stewart hit .380 and helped lead the Warriors to the NCAA Super Regional, and #10 in the final NFCA Top 25 poll.